Dental stains can have far-reaching effects on patients' appearance and self-confidence. Dr. Lurie offers a variety of ways to remove deep stains and brighten smiles. A teeth whitening treatment paired with a dental crown or porcelain veneer can help patients achieve a dramatic overall enhancement. Dr. Lurie will evaluate smiles and overall treatment goals to determine the best teeth whitening option for every patient. Contact our East Brunswick, NJ, dental practice to learn more about how to achieve a sparkling, new smile. Dental stains are a common problem for adults of all ages. Discoloration usually develops due to certain food and drink. When patients consume heavily pigmented food or drink (such as berries, coffee, and tea) the dark-colored molecules (chromogens) can attach to dental enamel. This process can give the teeth a yellowish or brownish tint. Combination in-office and take home Glo Science is a popular and effective method for whitening teeth, since it offers such rapid results. Smoking, certain medications, and genetics can also lead to stains on the teeth. Some patients feel that their discolored smile makes them look older, even though they are in good overall health. Teeth whitening can easily eliminate dental stains, with virtually no risks or discomfort. A whiter smile could give patients a boost of self-confidence, which can lead to positive changes in their work or social lives. Patients can also choose to undergo teeth whitening in conjunction with other treatments. For instance, if a patient is having porcelain veneers placed on one or two teeth, whitening can enhance the rest of the smile, as well. For patients interested in brightening their teeth, Dr. Lurie suggests completing the teeth whitening treatment first, so that their smile can benefit from a comprehensive treatment. GLO Science is a popular and effective method for whitening teeth, since it offers such rapid results. During a teeth whitening session, we will cover patients' teeth in whitening gel, and activate the material using a specially formatted light. Molecules in the gel will break apart the stains on the enamel. After about 15 minutes, we will remove the gel and apply a new layer. This step may be repeated up to three times, and the entire treatment session will typically take about an hour. GLO Science can noticeably lighten a smile by several shades. Once your in-office session is completed, you will be given your take-home portion of Glo. This will include the whitening gel and your personal mouthpiece to deliver the gel to your teeth, just as it was done in the office. 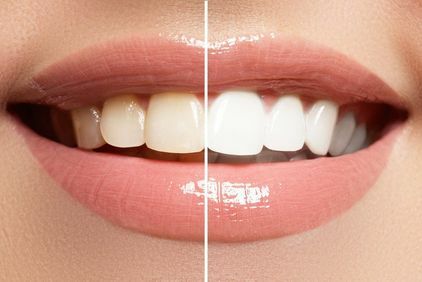 By using the at-home portion of your Glo Science bleaching technique you will be able to maintain your beautiful new smile for years. Simple take-home whitening kits can offer comparable results to in-office care, although the process takes longer. If patients choose to whiten their teeth at home, Dr. Lurie will provide them with a set of custom-made whitening trays. The appliances will be made from impressions of a patient's dental arches, and they will fit comfortably around the teeth. Patients will also receive whitening gel, which they can place directly on the trays. Patients will typically wear the trays once or twice a day for 30 min at a time, or wear them while they sleep. The gel works similarly to that used during in-office treatment, and the peroxide will break apart stained molecules. The full treatment regimen typically lasts about two weeks, but this will depend on the severity of the stains and how the teeth respond to treatment. At-home whitening can be a good option if patients are on a budget. However, in-office care may be best for those who suffer from tooth sensitivity. In the office, Dr. Lurie can monitor the entire process and keep the whitening gel from touching any sensitive gum tissue. For more minor touch-ups, Dr. Lurie recommends Crest Whitestrips®. This is another whitening option for at-home treatment. Dental professionals have agreed that Crest is a reliable over-the-counter whitening strip type. However, the results will not be as dramatic as the results from dentist-supervised care. For patients who are self-conscious about the dental stains on their teeth, we can offer a bright, sparkling smile after just one in-office whitening treatment. Contact our practice to learn more about teeth whitening, and to determine which option is most appropriate.